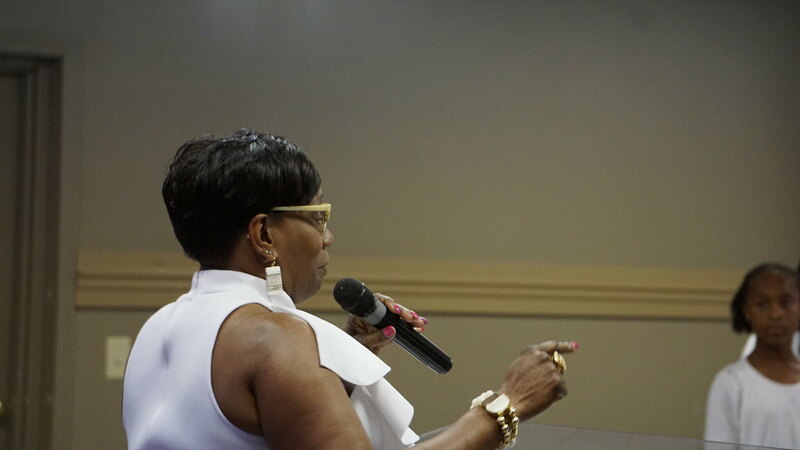 Once again God spoke through first lady Co-Pastor Barbara Davis with passion and power. She proposed a few questions; what's in your fiery furnace? Are there scars buried so deep inside of you that you have finally come to the conclusion you cannot fix them yourself? Is reality staring you in the face? Well, only Jesus can heal you by humbling yourself and acknowledging you need Him. She spoke on how acknowledgment is good for the soul, especially your own. "Don't be a leaky Christian they received the word of God, but it comes out as quickly as it goes in". Lady Davis spoke on how God did his work. How Jesus suffered, was beaten, whipped, flesh torn from his body, and bruised. She also indicated all the suffering and pain that he went through for us [Isaiah 53: 5]. Now here's the question; are you willing to at least meet God halfway? It was not easy for Him, what makes you think that it will be easy for you? It is better to suffer with Christ, to go through and achieve than to stay in pain and die in sin. She also spoke of seeking his face. Seek the Lord and study to learn the things that please Him. It is not a great mystery to want to know the things that put a smile on the face of the one who loves you so. For the Lord should always come first [Matthews 6:33]. Another topic she spoke on was lust. Women who are seeking a husband ...STOP...! If it is a husband that you desire, let God bring him to you. OR "You can find yourself only with a pair of pants". If it is a husband that you desire, let God bring him to you. OR "You can find yourself a pair of pants". She emphasized how important it is to listen to your leaders in your church. They constantly seek the face of God and study His word because they care for every soul of their flock. Lady Davis also spoke on the subject of restoring health [Exodus 15: 26]. God is faithful to heal you and the wonderful thing about it is "when He heals you "he doesn't leave scars". Having fear of the Lord, meaning having great respect for the Lord. Giving him reverence and loving Him with all that is in you. First lady Davis spoke on shame, don't be afraid to talk to your children about your life experiences. Let them know that your life wasn't perfect. You had to learn the ways of the Lord also. Teach them to bring the Lord into their heart and mind, and in all things, see His goodness. Plant good seed into them so that when you are not around, the Word, will always whisper in their ears. We say we love Him, let this be the day that we show Him! You can listen to the service below. Check out photos of the affair below.